This is a game changer in my book for Little Caesar’s. The new “Deep! Deep! Dish” pizza is available on their Hot-n-Ready menu for $8 bucks. It’s essentially the triumphant return of their square-pan-style-pizza. This is a genius move, and comes at a time when my love for Little Caesar’s is at an all time LOW. Back in the day, the square pizzas were the main choice from Little Caesar’s. It was their thing. Oh sure, they made round pies too, but their claim to fame was that they always sold their pizzas two-at-a-time for a good price and that the pizzas were square deep dish. And back in that day, Little Caesar’s ROCKED. They had a tangy sauce, a cheese blend like no other pizzeria, and the crust was awesome. New stores were popping up everywhere. They even had mini cafes inside of K-mart. Flash forward a few years and stores have closed, sales are down, and there isn’t a Caesar in sight. The company scaled back and regrouped. Since then they have made great strides and are regaining ground. Several stores have been built in and around the DFW. The return was a success mainly by the “5 dollar pizza” promotion that they have been running for a couple of years now. It has forced other places to drop prices and compete. It also meant they had to all but abandon the square deep dish pies in favor of the cheaper and thinner crusted ones. I was glad to see Caesar return, but I never liked the hand-tossed pizzas from there. Don’t get me wrong, I have had plenty of the 5 dollar specials, but they have always left me wanting. For me, Little Caesar’s IS that thick crust with the crunchy corner slice. It’s just a great style. It was sorely missed. What you get now is two square pies for the 8 bucks. This gives you more “corner pieces” that everyone loved. I couldn’t wait to tear into this. After seeing the commercial on TV I knew that evening dinner was already taken care of. It tasted just like I remembered it too. Probably been a good 8 years since I had Little Caesar’s Pan pizza. I sincerely hope these stay around for a long time. 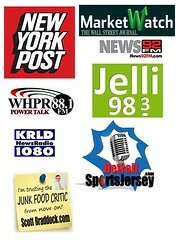 Categories Addictive, Pizza, Taste Test, Tasty Treats, This S#!+ is ADDICTIVE!! Pizza Pizza – Kit Kit?? I passed this truck and first thought it was an ad for a toy pizza oven. Like an easy-bake oven just for pizza. Wouldn’t that be a kid’s dream? Have their own pizza oven to use anytime they wanted? Ok, well just like the kids, I was disappointed to find out it’s something else entirely. 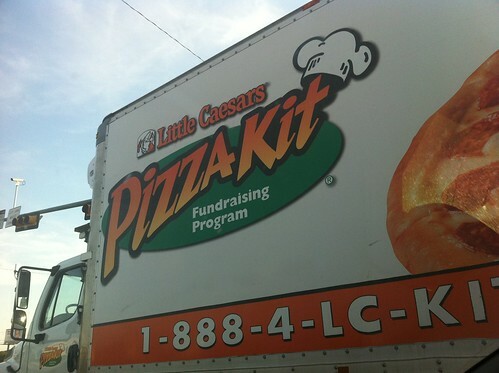 Turns out, Little Caesars has a fundraising program. You can sell pizza kits for your school. For 19.00 you get three complete pizza kits. Ready-made crusts, sauce, cheese, and pepperoni. Now I am no mathamagician mathalgahm mathalon math professor, but my nearby Little Caesars sells hot-and-ready pepperoni pizzas for 5 bucks. 5×3=15 bucks (before tax). These pizza kits are 19 bucks. LC suggests that you can earn up to 5-7 dollars profit per pie. So you are obviously selling these kits for more than the 19 bucks you spent on them. Like say, what? 25 a pop? Let me see if I got you: You want me to pre-order three pizza kits, wait a couple of weeks, then assemble and cook these pizzas at home, and over pay for them. Sounds reasonable. I know it’s for charity – but how about this – why not just go and buy the hot-and-ready pizzas and sell them at school for a buck a slice? Or at games or something?